Patrick Watson and Christian Stoehr speak outside the courthouse following the conviction; at left is Josh Crosby. Photo courtesy of Jared Shier. After a giddy few hours, reality is sinking in. 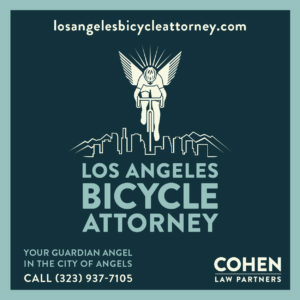 Monday afternoon, the jury in the Mandeville Canyon case returned a verdict far beyond the wildest hopes of most cyclists. Dr. Christopher Thompson was found guilty on all seven counts of the indictment. He was convicted of the following: 2 counts of Assault with a Deadly Weapon (245a), 2 counts of Battery with Serious Bodily Injury (243d), reckless driving (23103a), Reckless driving causing specified injury (23105a), and Mayhem (203). “There’s not a cyclist in Los Angeles who would feel comfortable with this defendant out on the road after this verdict,” Stone told the court. Jared Shier notes that six of the seven counts were felonies, with the only misdemeanor involving the incident with Watson and Crosby. Now the Good Doctor faces up to 10 years in prison for the infamous Mandeville Canyon Brake Check. Of course, the exact sentence depends on the judge. He could take Thompson’s lifetime of healing into account, along with the fact that it was his first conviction — though his third alleged offense — and decide to be lenient. Or he could take the previous incidents and the seriousness of the crime into account, and levy the maximum penalty. We’ll find out in about a month, with sentencing scheduled for December 3rd. Then the inevitable appeals will begin; how much time he actually ends up serving is anyone’s guess. One thing that is a near certainty is that this will cost the Good Doctor his medical license. And that’s a tragedy, not just for him, but for all those people he could have helped — if only he could have kept his anger in check. On the other hand, he could be the world’s greatest ER physician, but like Peterson and Stoehr, I wouldn’t want him to touch me, either. Even though, for once, a handful of cyclists received the full support and protection of the legal system, this entire event was a tragedy. Two cyclists were severely injured, three others threatened. And an otherwise good man, by all accounts, let his frustration and anger boil over until he used his car as a weapon, sending two total strangers to the hospital. And tearing his own life and family to shreds. And there’s a lesson in that for all of us, cyclists and drivers alike. 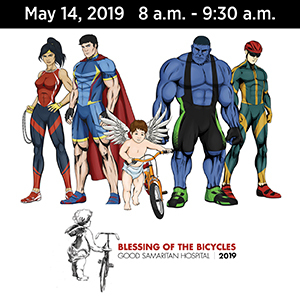 All of us in the local cycling community owe a big round of thanks to the LAPD and the District Attorney’s office — and especially to Mary Stone for what was, by all accounts, a powerful and effective prosecution. And I personally want to give a huge thank you to DJwheels, without whom it would not have been possible to cover this case in such detail. Danny, I owe you one — big time. Best wishes to you and your fiancé on your upcoming wedding. But this is just one case. As DJwheels notes, there are at least five other cases working their way through the system in which cyclists were the victims — including the Rod Armas and Joseph Novotny cases, in which cyclists on group rides were killed by hit-and-run drunk drivers. Then there’s the case of DJwheels own fiancé, who was injured when a group of riders were threatened by an aggressive driver who fled the scene; thank God, she had a far better outcome. Which probably explains why he worked so hard keeping up with this case. Finally, let’s just remember to be careful out there, especially for the next few days. And try to keep those words and gestures to a minimum. As happy as we are over the verdict, there are those in the four wheel community who are just as angry about it, and they’re armed with 2,000 pound potential weapons. And as the Good Doctor clearly illustrated, some people aren’t afraid to use them. 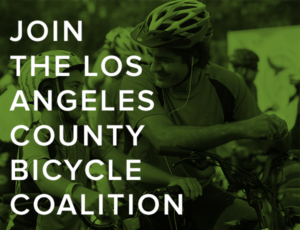 In light of the Mandeville Canyon case, the L.A. Times asks if we can all share the road, along with advice on how to ride safely — and for a change, looks at it from a safe driving perspective, as well. And Damien Newton looks at the Times series, and what they left out. Dr. Alex offers 12 principles for a more effective bike plan, while Stephen Box imagines what the city could be like if the mayor rode a bike. Joe Linton looks at the new Fletcher Drive undercross on the L.A. River bikeway. Do more bikes mean more — and more severe — injuries? San Francisco prepares to move forward with their bike plan. The San Jose Mercury News takes a look at the problem of right hooks — like the one that almost hit me yesterday. Floyd Landis suspects his Tour dreams are over. Following the Texas governor’s bone-headed veto of that state’s bike safety law, Austin passes their own three-foot passing law. Bob Mionske reminds riders about the need for lights and reflectors. Beirut goes Critical Mass. New Zealand suspects a local hit-and-run driver may be targeting cyclists, while some drivers are going “berko over bisychos.” Maybe the world’s standard for bike sharing isn’t working so well after all. Finally, from my old home town, a fascinating in-depth, 18-month examination of bike/car crashes throughout the city, mapping out where and how they occurred; this should be a model for every city — including ours. I call BS on this. The guy lost his temper, tried to frighten the riders, severely misjudged their ability to avoid crashing , caused injuries, then LIED ABOUT IT ALL rather than admitted his very serious mistake. Maybe “those in the four wheel community” could sympathize with losing his temper, but I don’t believe that anyone seriously defends the rest, especially the cowardly lies. Had he told the truth, there could be room for more sympathy, although he would still have a price to pay. Cyclists sometimes hog the road, and that annoys drivers. It’s wrong to hog the road even if you think the law allows you to do so, but it’s incomparably more wrong to endanger cyclists with your display of anger. There is no room for being either passive-aggressive or aggressive-aggressive on the road. Both cyclists and drivers need to re-learn the Golden Rule. Actually, I was being mild in saying that. I was going to include some of the hate mail I’ve gotten since the verdict was announced, then decided that I didn’t want to give crazies like that a forum to spout their anger. Instead, I’ve just hit the delete button, and feel so much better for it. And evidently, you didn’t just hear the driver on KPCC’s Air Talk program, who blamed cyclists for this incident, and said this won’t be the last time cyclists will be hit in Mandeville Canyon — and next time, he said, someone will likely be killed. I’d also like to add that my usually relatively peaceful commute was not so peaceful the last two days: I got told to “get off the road” the evening of Nov. 3; and on the morning of Nov. 4, an SUV honked at me several times and then swerved into the bike lane behind me. I wasn’t aware that the trial had ended until just a few minutes ago, but it might explain in retrospect these occurrences. 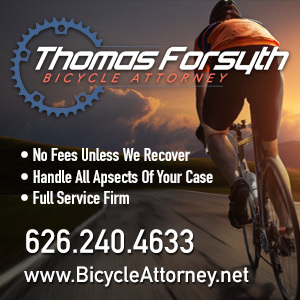 I am a cyclist who works at a law firm in Dallas (though I am not an attorney). I have obviously followed this case with great interest. I just wanted to say thanks to you and to DJWheels for really doing a great job on the coverage – really: thank you. With the number of cyclists (usually riding safely and legally) who are run down because “I didn’t see him”, and where charges are never filed, this brings a small sense of justice to us all. Though I think they cyclists could have handled it better, I understand why they responded as they did and I actually appreciate the fact that they stood up for themselves and responded equally to the verbal assault the soon-to-be-former doctor unloaded. It’s unfortunate that the situation escalated. I don’t think it gives us as cyclists license to behave similarly, but it does mean that no one should expect to be exonerated for deadly assault resulting from a simple exchange of verbal insults. I’m hoping that the judge sends a message out there. Let’s go out there, ride responsibly and drive responsibly as well. Ted (it is Ted isn’t it, my apologies if its not), pretty much everyone except those who consider John Howard god (which like finding a Bush supporter in the US is fricking hard to find) thinks Miranda Divine is a few sandwiches short of a picnic. What is hilarious though is that was her backpedal article. Yep, it’s Ted. Although I’ll answer to just about anything, including the names my wife calls me if I don’t wipe the bike off before I bring it inside. More like 4,000 pound potential weapons, if you look at the average curb-weight of passenger vehicles on the road. Thank you very much for such in-depth coverage and excellent reporting. It’s going to be a long struggle to make the roads safer for everyone, and we need all the information we can get. I don’t think we have any indication here that he simply wanted to “frighten” them. If that was all he wanted he would have shown some freakin’ remorse at some point immediately following a cyclist dropping in through his rear window. All they got out of him was self-righteousness and more vitriol. If it had been me, I would have been beside myself after a crash like that (ok, so I’m not good in a crisis). I have to agree with you. If I’d hurt someone that badly, I’d be a basket case. Heck, I once ran over a pigeon that didn’t get out of the way fast enough, and felt sick about that for a week. And I don’t even like pigeons. Hey now, what’s this about pigeons? It was a standing pigeon, not a flying one. I once collided with a flying crow during a descent. I think it escaped without too much damage (as did I), but I felt pretty bad about it. On a related note, when I was touring across the midwest, I came across several hawks lying on the side of the road that were most likely victims of truck turbulence: they were probably flying low using the thermals coming off the hot concrete and got sucked into trucks’ vortices. I agree with most everything in your article but one: Your comment that this will cost Thompson his medical license. State Medical Boards are very lenient when it comes to outrageous physician crimes. In Texas recently, that particular Med Board opined that child sexual abuse by an MD was no valid reason to deprive an abberant doc his favorite sport. He got his little hand slapped,presumably the one that gropes kids. The state of California has a Medical Board that reinstated an MD’s license after comitting murder, chopping up his victim and shoving her parts down the sewer. Oh, sure he served time and got his license pulled – for a while. But they gave it back. Thompson will get a swat on the tush and possibly serve a little time – not much, though. And when he is released after a year or so, he’ll move away and his license will be quietly reinstated. And the state board, the hospital where he’ll work and the AMA, will do all in their power to ensure no pesky patient ever learns of his misdeed. That would be like . . . well, treating him like just any other felon. Next time you’re bored, take a look at the MedicalManiacs website. Thompson is about to be added to the 237,000 other “Dangerous” or “Questionable” degree characters.